Trinket's got a big sister in town - the Pro Trinket! Pro Trinket combines everything you love about Trinket with the familiarity of the core Arduino chip, the ATmega328. It's like an Arduino Pro Mini with more pins and USB tossed in. SoftwareSerial will not work on the 3V Pro Trinket without changes. See this FAQ. Trinket is supported on Linux, Mac OS or Windows! Red #13 LED - this LED does double duty. Its connected with a series resistor to the digital #13 GPIO pin. It pulses or blinks nicely when the Pro Trinket is in bootloader mode, and its also handy for when you want an indicator LED. Three mounting holes make it easy to attach with 2mm screws (M2 metric or #2 imperial) or even tiny zip-ties, string, etc. BAT+ is the Battery + Input pin. If you want to power the Pro Trinket from a battery or power adapter or solar panel or any other kind of power source, connect the + (positive) pin here! You can connect up to 16V DC. If you have a 3V Pro Trinket, you'll want at least 3.5V input to get a good 3.3V output. If you have a 5V Pro Trinket, 5.5V or higher is suggested. This input is reverse-polarity protected. BUS is the USB Bus + Output pin. 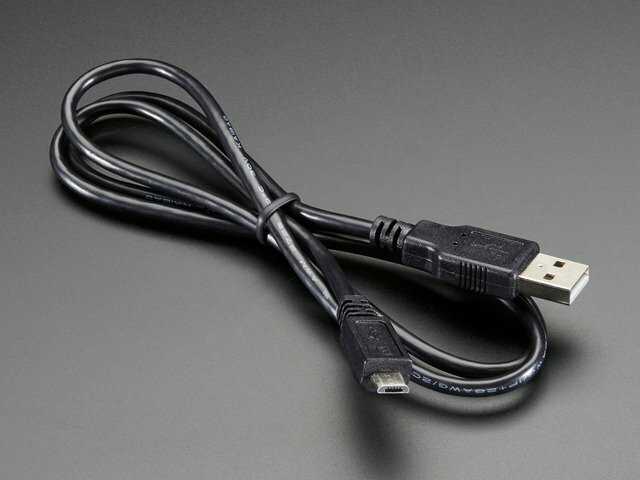 If you want to use the USB 5V power for something, like charging a battery, or if you need more than 150mA of current (this pin can supply 500mA+ from USB ports) or to detect when the Pro Trinket is plugged into USB, this pin will have 5V power on it if and only if its plugged into something via the micro B connector. Don't put power into this pin, that's what BAT+ is for - use it only as an output! The next pin is either 3V or 5V depending on which Trinket Pro you have. It is the output of the low dropout regulator. The regulator is powered by either BUS or BAT (whichever is higher!) It will automatically switch between the two if USB or battery is removed using two schottky diodes. There is a 0.2V dropout due to the diode and maybe 50-100mV minimum drop in the regulator. The regulator can supply approximately 150mA as long as it doesnt overheat. Make sure that you keep BAT+ low to minimize heat-loss! About 1 or 2 Volts higher than 3V or 5V is ideal. Next we will cover the 18 GPIO (General Purpose Input Ouput) pins! 18 GPIO is a big step up from the little Trinket with only 5 or so pins. This is almost as many as a 'full grown' Arduino. In fact, since the Pro Trinket uses the same core chip as an Arduino, nearly any existing project that uses special pins like hardware PWM or SPI will work 'out of the box'. Digital 13 - Also known as the SPI CLOCK pin. This is also connected to the red #13 LED! Note that Digital 2 and Digital 7 are used for the dedicated USB bootloading setup and are not exposed/available! The two pins that sit sort-of inside the body of the Pro Trinket, A6 and A7, are analog input only pins. They're kind of an 'extra' that you get with the Pro Trinket. These pins cannot be used for LEDs, buttons, servos, etc. They're only for analogRead() usage! If you're used to using an Arduino Uno, you may notice that pins #2 and #7 are not available. That's because we use those two pins for the USB bootloader. They are not available for use and are not broken out. RST - This is the Reset pin for the Pro Trinket. Connecting this to ground momentarily resets the Trinket and also starts up the bootloader. At the bottom is 6 pins in a row that we call the FTDI header. 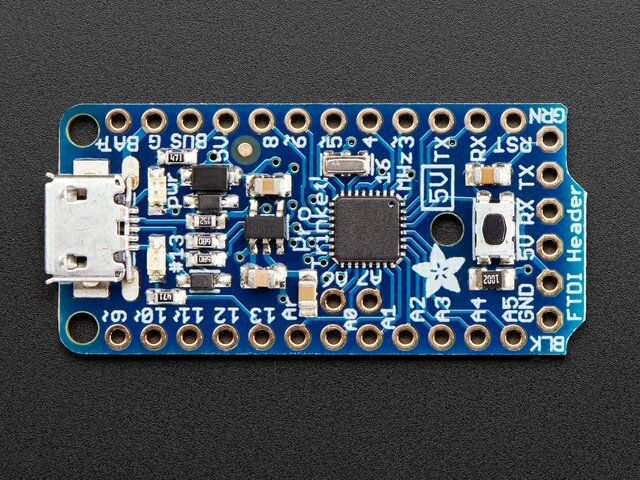 You can use these pins to program the Pro Trinket with an FTDI cable or FTDI Friend. You can also use it for serial debugging. For beginners, we suggest using an FTDI cable for programming and debugging, especially if you aren't simply porting an existing Arduino project to Pro Trinket. Much like many Arduino-compatibles, there's a header for connecting a 'classic' FTDI cable or FTDI friend. The bootloader on Pro Trinket is dual USB & FTDI "optiboot" so you can use either the USB port or the FTDI breakout to upload. However, only the FTDI port allows you to use Serial debugging. So it's a bit of a tradeoff - USB is inexpensive, built-in but requires a button press to start & there's no debugging, FTDI requires an extra cable but has auto-reset and debug console. Make sure you're selecting the FTDI-program type in the Boards menu! Don't forget you'll need to install FTDI VCP drivers, available from FTDI chip. Then select the COM port from the Tools menu as well, to upload! Of course, you can use the FTDI cable for debugging not just programming! To use the FTDI cable to debug programs, add the standard Serial.begin(baudrate); line as you would with an UNO and Serial.print or Serial.println as you expect! Then select Tools / Serial monitor after loading your program. The Trinket will re-start when you launch the monitor so you can see your data right from the start; be patient while the Trinket finishes starting. 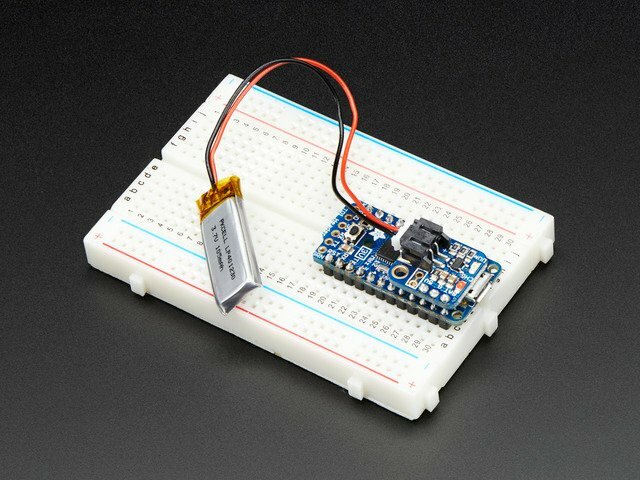 Chances are, you picked up a Trinket because it is programmable with the Arduino IDE. The Pro Trinket uses the same core chip as Arduino UNO, and the 5V Pro Trinket uses the same clock rate and voltage so its pretty much a full Arduino-compatible, just smaller! Even though Trinket has a USB connector, it does not have a "Serial Console" capability, so you cannot use Serial to send and receive data to/from a computer without a separate FTDI Cable! Just follow the steps in the Adafruit Arduino IDE setup guide to add Adafruit board support to the Arduino IDE to program Pro Trinket! When you're finished installing the IDE come back to this page to continue the Pro Trinket guide. OK let's practice uploading a sketch by uploading the classic Blink sketch with the USB bootloader. This program with blink the onboard red LED that is connected to pin #13. Next go into the Tools -> Programmer menu and select the USBtinyISP programmer. Plug in the Trinket, make sure you see the green LED lit (power good) and the red LED pulsing. Press the button if the red LED is not pulsing, to get into bootloader mode. Also, don't forget to install the Windows driver if you're using windows! The Pro Trinket uses the Atmega328P chip, which is the same core chip in the Arduino UNO/Duemilanove/Mini/etc. It's the 'classic' Arduino chip! So you'll be happy to hear that not only is Pro Trinket programmable using the Arduino IDE as you already set up, but 99% of Arduino projects will work out of the box! The Pro Trinket 5V runs at 16MHz, just like the Uno. 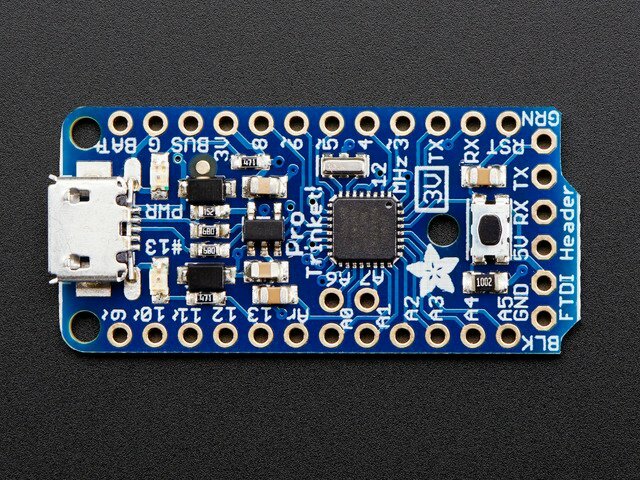 The Pro Trinket 3V runs at 12MHz, which we suggest for 'power users' who want a 3V Arduino-compatible and don't mind its a bit slower at 12MHz. The 3V Pro Trinket runs at 12MHz not 16MHz so its a bit slower. These are only tested on an UNO! For non-UNOs you'll need to swap pins 11, 12, 13 for the hardware SPI pins but we haven't tested it at all, so UNO only please. Try a different USB cable. Some cables are "charge only" and don't have data lines. And even with data cables, some work better than others. Can I use an EZ-Link to program a Pro Trinket? We do not offer any support for this code, it is released as-is! This guide was first published on Aug 20, 2014. It was last updated on Aug 20, 2014.